Today I stood in the river where the first baptism in Europe took place. (Yes, I know it was all Holy Roman Empire then… but it is still amazing!) 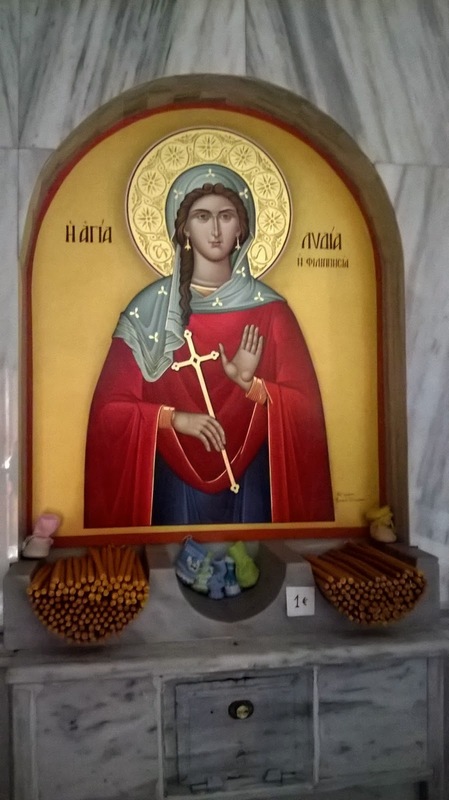 The wonderful Lydia of Thyatira, for whom I have a real sense of admiration, came to know of Christ and was baptised just outside Philippi, and we visited the area where her baptism took place this morning – along with Philippi itself. 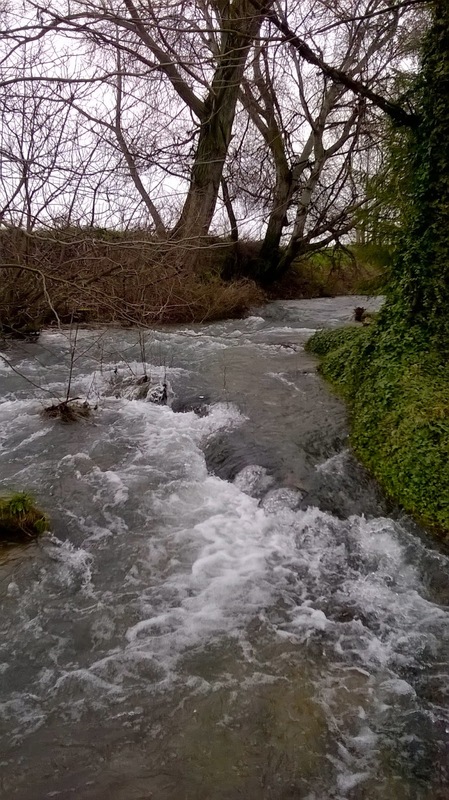 The river was very fast-flowing today – a sign of the water running off the surrounding snow-capped hills and mountains, I guess. I can vouch that it was also quite chilly (although not as chilly as I expected it to be). Yes, I did indeed put my feet into the water! I didn’t wear my sandals especially in order to be able to take them off and stand on the steps into the river, but wearing them meant it was a whole lot easier to do so. I was the only one, sad to say – but it has been a rather cool and grey day for the most part, and everyone else is obviously rather more sensible! The church that stands close by the river is quite lovely. Built in an octagonal shape (which, apparently, means that it is built to mark something significant having happened on a particular site), it is a feels quite modern – and the mosaics on the walls are quite lovely. Central to the building is the baptistry which is full to bursting when a child is brought for baptism. 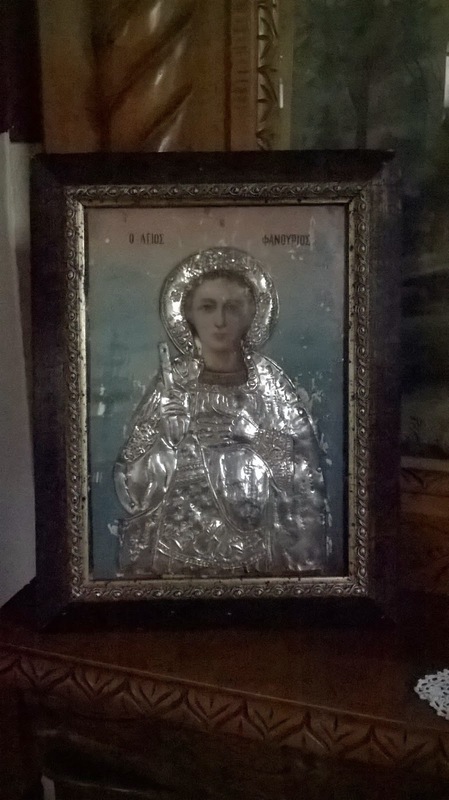 The iconostasis is rather smaller than some I have seen on my travels in recent months, and it is certainly a lot smaller than the ones of both the Church of St Nicholas in the middle of Kavala and the Church of St Mary that stands in the middle of the Old Town. We learned here that the colour ‘we’ think of as royal purple is apparently quite incorrect as the colour Lydia produced was rather more red in tone. 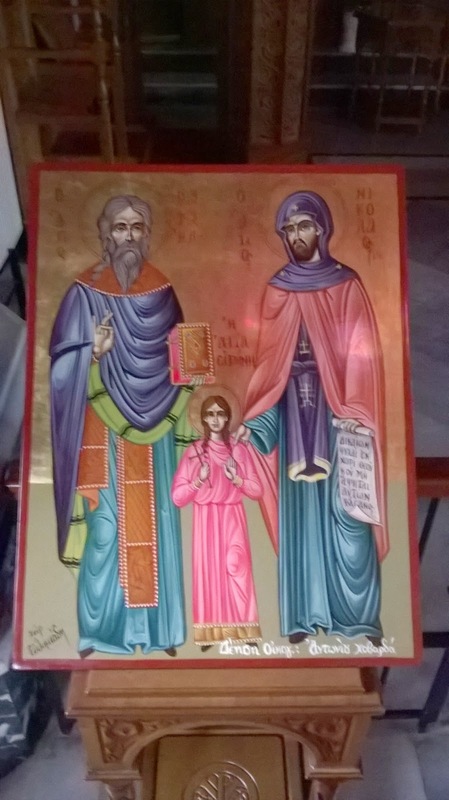 Thus it is that icons of Lydia, as well as those of the Virgin Mary, portray them in what appears to us as red. 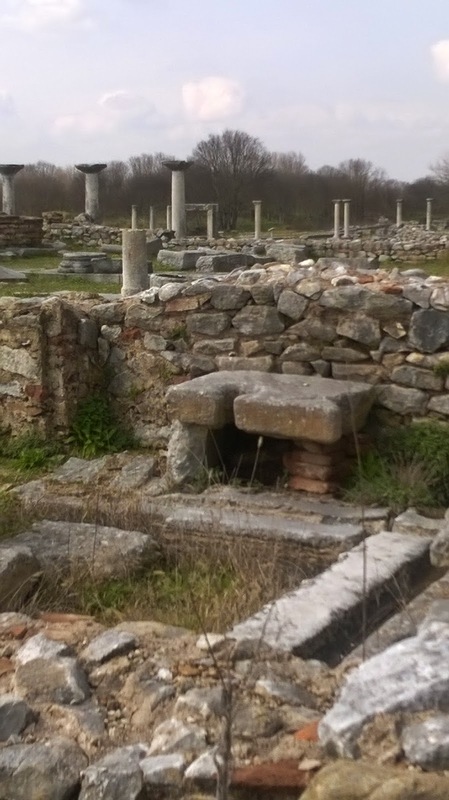 The remains of the City of Philippi stand close by and, just as it is when journeying through the Holy Land and Turkey, so it is here – the sense of wonder at following in the steps of the Disciples and Apostles. How wonderful to be journeying through the same countryside, viewing the same hills, rivers and seas, worshipping the same God, praying and praising in words that they used – passed on by those who had known Jesus or heard of him directly from those who knew him. And then there is Paul and his companions – Roman Citizens who travelled freely through this land, unless sent on their way by those who would not hear the Word of God that was being shared with them. 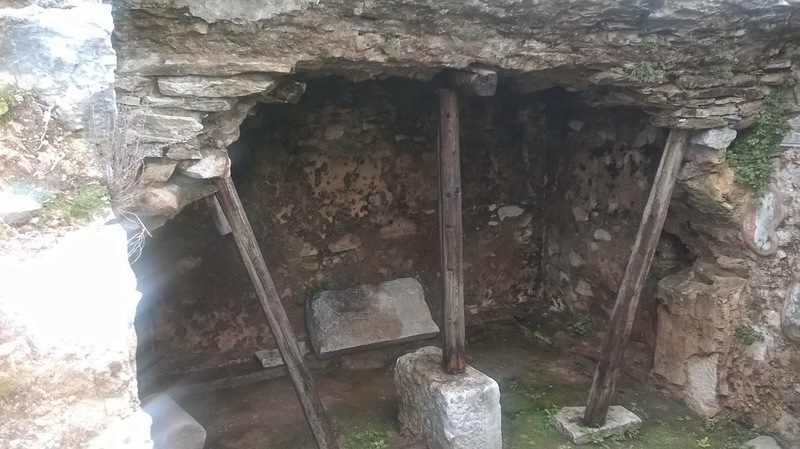 At Philippi, Paul was imprisoned and we saw the place that Tradition reputes to be the jail. The remains of the city are relatively extensive, to include a Theatre, two Basilica, the Agora, a Business area, as well as an area that served as a sort of ‘Bishop’s Palace’. Here there are lovely floor mosaics that remain, as well the toilets for the Bishops and their guests! 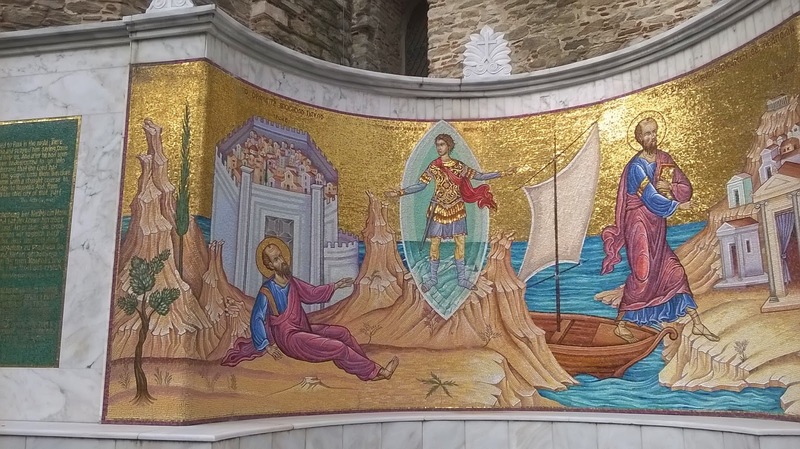 Back in Kavala (Biblical Neapolis) a scoot around the town revealed the wonderful mosaic monument that marks where Paul took his first steps on land here, which stands next to the Greek Orthodox Church of St Nicholas. Heading up onto the peninsula, one passes the very fine remains of the aqueduct, as well as the Castle high on up the hill. A Mosque has been built on the remains of a Basilica, with the foundations of the Church sensitively laid open for visitors to see. 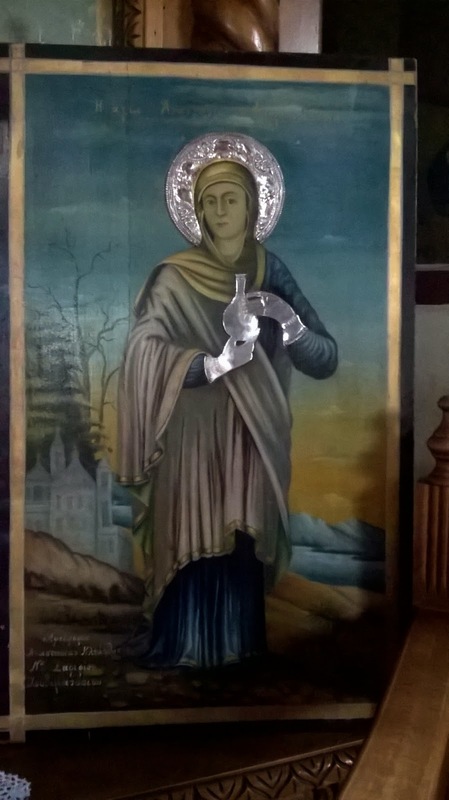 Further on lies another Church – with the most wonderful candelabra and silver-enhanced icons. A service was taking place here, with the wonderful Orthodox chanting that is so deep and resonant. The congregation was hidden behind a curtain so we didn’t go in, but simply remained in the body of the church, listening and praying, whilst taking in the beauty around us. It is such a ‘Wow!’ feeling to be here in this land. Not only to be here journeying through the same countryside, viewing the same hills, rivers and seas, worshipping the same God, praying and praising in words that they used but also to have an increased sense of awe for the amazing determination of these men. The distances they travelled, the means by which the travelled – countless miles of land and sea – all to share the Gospel message of Jesus Christ. I come as a pilgrim, to see where they travelled and through this I am encouraged in my faith (and challenged too). Paul and the other Apostles came not to follow anyone else’s footsteps, nor to see where other heroines and heroes of faith had been before them. They came to blaze the trail, as well as send the Gospel message even farther afield. How amazing to be here and to visit places of which I have only read before. Wow!